Sanibel Harbour Marriott Resort & Spa crowns Punta Rassa, a private 85-acre peninsula where the Caloosahatchee River meets the Gulf of Mexico at the tip of Fort Myers, Florida. 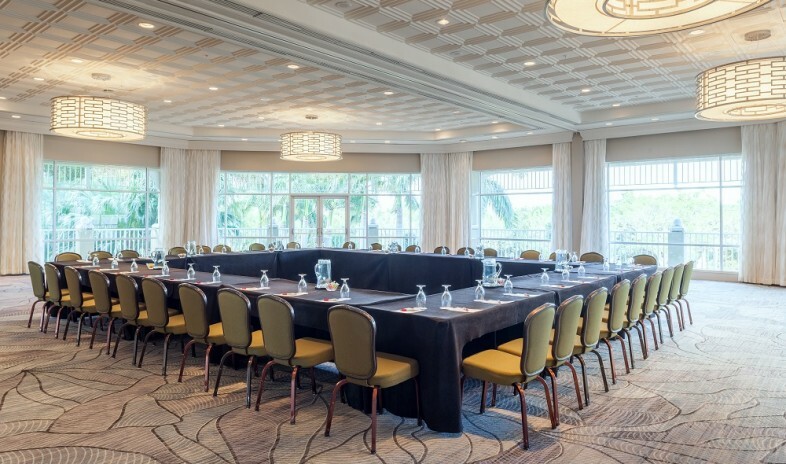 As popular with conference goers as with honeymooners and families, the resort entertains with the magic of its Sanibel and Captiva Island views, and luxury associated with the Marriott name. The resort provides a wide choice of accommodations, but all 347 guest rooms and suites feature signature Marriott amenities, wired and wireless Internet access, and private balconies with wide-open views of the peninsula and gulf. The choice of venues for groups spans four ballrooms and eight breakout rooms that divide into a total of 25 spaces—all conveniently located on one floor and most with natural light and scenic views through floor-to-ceiling windows. The latest technology supports everything from central control of all audiovisuals and lighting to closed-circuit TV, satellite linking, and exceptionally clear sound. Off duty, colleagues often regroup for cocktails and tapas at Charley’s Cabana Bar, steak and seafood at Courtside Steakhouse, regional specialties at Tarpon House, or all-American fare at the Cove. When it comes to activities, sunset dinner cruises aboard the Sanibel Harbour Princess kick off the long list of favorites, closely followed by lounging at the beach or beside three outdoor pools, tennis on five courts, and visits to the 40,000-square-foot health club and spa. Great hotel and property with good conference services staff. Food was excellent, which is good because the property is a little out of the way (not close to many restaurants). If you're looking for a waterfront location, it's wonderful with many rooms with balcony waterviews and gorgeous sunsets. We were there in January for a smaller, 2 night meeting so we didn't plan activities/recreation. We were going to have a dinner reception on the small private beach they have, but it got too chilly and windy. The staff was accommodating and able to move us to an inside room. Our meeting was a huge success due to highly motivated and knowledgable staff! Wonderful view and unique meeting space - many with windows overlooking the harbor.